I'm a day late, but still wanted to share. I needed to clear out some scraps and decided I wasn't sick of rainbows yet, and made this rainbow quilt. I always think it will make a bigger dent in my scraps than it does, I'm still almost overflowing. I try to keep my scraps from getting too out of hand, so I have a method that seems to work for me. Scraps first go to a drawer in my sewing table. The scraps in this drawer get used a lot, it's kind of my go to bin for fabric. Once that drawer is full, I start sorting by color. I have a shoe size bin for each color (2 bins are missing from this photo). 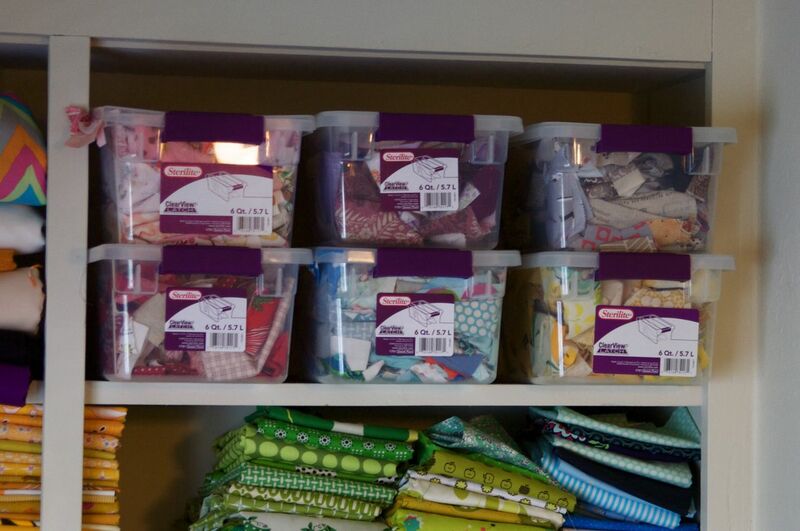 This is my limit--if the bin won't close I just have to start a scrap quilt. Currently my blue and pink scraps are really, really full. I've got to figure out a blue and pink scrap quilt I guess. anybody have any great tips for managing scraps?? I love this quilt. I once made a rainbow quilt for my son's college roommate who came out of the closet during their senior year. I embroidered a little man that blended in and was somewhat hard to see. I called the quilt "Come Out, Come Out, Wherever You Are!" Your quilt is wonderful. That's lovely! I have a question--what size pieces do you consider scraps, and what size do you put back with the rest of your fabric? Mmm..rainbows...makes me want to be in Hawaii. I love your rainbow quilts..esp since you added pink! If you're overwhelmed with scraps, feel free to spread them around a little. I'd love to see some scrap bags in your shop! I love your quilt! I kind of do something similar with scraps. Mine go in a Liberty London target bin. Then when I can't take it any longer I sort them by color and put them away in the plastic containers. Rainbow quilts are so happy...I love this one! Then I could use some of my fave patterns AND I started making lots of table runners. anything long & skinny I set aside for my mom, who likes to make string quilts. It's beautiful... and it has me thinking about all MY scraps! I really, really love your quilt! I have scraps that are completely our of control. I like your sort and store system for scraps. I think that would work well! And then I'm going to start a rainbow quilt because yours is so pretty! Thank you for the inspiration! loving all the rainbow quilts these days. Really loving yours! well done! Just wanna say I love your quilts! Love love this quilt! I sort my scraps by colour as soon as they are created. I've only got three containers: white/cream/yellow; black/white; everything else (biggest basket). I go into them most often for the Bee that requires me to sew from my own stash, or for little projects. I am thinking I would prefer a system like yours, with clear containers on a shelf that is more visible. But then I'd need shelf space. I keep meaning to sort my scraps by colour. At the moment they go straight into ziplock bags (new one started as the previous fill up) and just get piled up on my workroom shelves. I feel a more aesthetically pleasing and/or accessible system needs implementing before I disappear under a mountain of ziplock bags! I love your scrappy strippy rainbow quilt - it's gorgeous! I usually use my scraps for string or mile-a-minute quilts. Today I finally gave in and freecycled a big bag of bits and pieces that I won't get to any time soon - I hope the recipient loves scraps as much as I do! 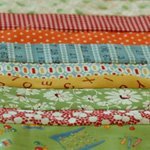 You can use your "less than beautiful" scraps to make cage quilts for animal shelters - it's a good way to use up bits and pieces/extra blocks/leftovers/extra batting/fleece/flannel etc. fabrics that won't work with your usual projects! The dear Jane quilt you started is going to be a great place to use up some scraps. Paper piecing is my favorite way to use up small scraps and for the pattern you are working on you should make a good dent in your scraps. I love your rainbow Nettie! Ok, I may gush about all kinds of quilts, and go on about how wonderful they are, but this one is the BEST yet!! I sort them completely by color, not size, but I'm contemplating keeping the tiniest squares separate, since they always get lost in the pile. I sort my scraps by collection, not by color. To me, it seems that I just find the fabric I want better that way. I use a rectangular laundry basket from ikea that has a zip down the centre. i divide my scraps into warm and cools. then i have a small basket sitting on top of the fabrics (still inside the laundry basket) where i throw all my smaller scraps, (or bits of fabric that i have already sewn together and used some of). it works really well for me, and its neat and tidy! before i explain about my scrap method, i have to tell you that i don't stash. my "stash" fits into about three shoebox sized plastic containers. i buy specifically for projects and tend to buy little more than what i need. that said, there are always leftovers. unless the piece is a half yard or larger, it goes into "scraps." i throw the scraps into a plastic grocery bag. when that get's overwhelmingly full, i pull out and iron and begin to cut into uniform pieces. typically, i have cut into 5.5" and 2.5" pieces. i realized recently, however, that the 5.5" pieces aren't that useful because i typically only have 1-2 of each print. so, i'm eradicating 5.5" and going with all 2.5". once my pieces are trimmed to uniform size, i stack them by color. they all fit into a 12"x12" bin for right now. i'm planning to use them in a scrappy hexagon quilt. that will be fun! Great tips for managing scraps? There's only one place to go: quiltville.com. Bonnie's Scrap User's System changed my life. Seriously, give it a look-see. Gorgeous rainbow quilt! I love the easy-going randomness and happy happy colors. I love your rainbow quilts. Very fun! I generally use the same method, but I will also sort by size to a certain extent - so strips and little pieces are on their own and not thrown in with the bigger, colour-coordinated scraps. This is awesome - I love scrappy quilts! Cute quilt top! Your system for scraps is far more sophisitacted than mine... I have a large glass vase that I put strips in and I big tin tub that anything else goes in. 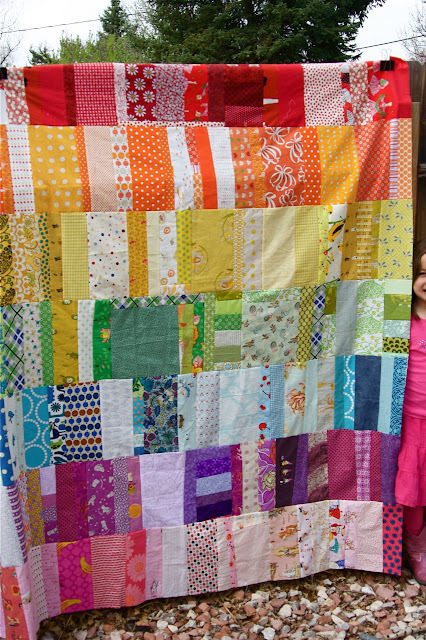 The rainbow scraps quilt is beautiful! I have only recently started organizing my scraps, and it's not the best system. Therefore, I have no advice to give on the subject. I love this quilt! Great ideas for storing scraps...Thanks for sharing! i'll take some off your hands. I think I died a little when I saw that quilt! Absulutely, positively gorgeous...I wish I had that kind of talent with color!!! that's a fun quilt, nettie! i think you hit the nail on the head. when the scrap bin is full, you need to make a scrap quilt. sounds like perfect advice to me. i had a whole passel of green scraps, so i sent them all to a friend. she used what she wanted and i hope she passed whatever she didn't want along to someone else. because we all know other peoples' scraps are more exciting than our own, right? Wow, wow and wow!!! You have inspired me to make a another rainbow quilt. Wonderful quilt! I really love the rainbow scheme! Looking at this quilt really gets me in the mood for spring/summer. I just love all of your colors...they inspire me to look through my stash!! I've just started quilting, so I don't have a "stash" ~ but, oh, how this quilt makes me wish I did! It's beautiful! I was inspired by the quilt, and I ALWAYS love pictures of the stash! I like to use 10 1/2 inch square scraps or anything that I am sick of cut into 10 1/2 inch squares made into a backing. It is a beautiful way use up odd bits and make a reversable quilt at the same time. Although i don't much like the word "scrap", all fabric is useful and beautiful. Oh my I love it! That would add such cheer to any room; thanks for sharing and God Bless! I just love this quilt and am making one right now with scrap. I have soooo many. I really like your organizing of the scraps by color! This is just exactly what I am doing right now...I could do scrap quilts till I die...so much fabric so little time. Thanks for the Pin! And inspiration.